Every once in a while I read a children’s book that is so good I just have to share it. 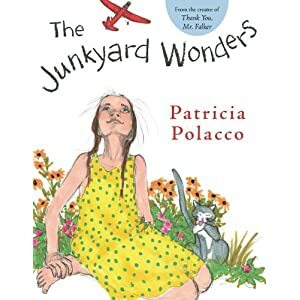 Patricia Polacco makes almost every “recommended books” list I’ve ever seen. When I’m at the library and haven’t planned ahead and put some good books on hold, she’s on my short list of authors I check for to make sure we take home at least one good book. Which is how we ended up with The Junkyard Wonders. I didn’t know anything about it other than that Poloacco wrote it, and the title combined with the plane on the cover made it seem promising. I should have previewed it first, but I didn’t. There is a very sad event halfway through the book. This true story is one of the most heart-warming and inspiring I have ever heard. It’s an especially good story for any child with learning differences, but it in no way isolates the “typical” child. If you want a full plot summary, I’m not going to give it to you. I don’t want to ruin it for you. But it follows the “misfits do great things” story arc that is so loved in literature and film. This is a story of hidden genius, the amazing things you can accomplish when you believe in yourself, and the power of having someone believe in you. Be sure to read the author’s note at the end. But have a tissue handy when you do. I recommend previewing this book yourself before sharing it with your child. One of the children dies halfway through the story and if you’re not paying attention (as I wasn’t) and you’re not prepared for it, it can be a real punch in the gut. As I realized what was happening I couldn’t read through my tears. I stopped and told Henry that it was very sad and asked if he wanted me to continue. He did. He handled it just fine, but he’s had some experience with death. You’ll need to decide if your child is ready for it. It’s not what the story is about, and the story doesn’t dwell on it, but it is crucial to the telling of the tale. The recommended age for this book is 3rd-5th grade and I think most children that age would be able to handle death the way it is presented in this book. Next PostRead Any Good Math Lately? Patricia Polacco came to M's school last year. M was so excited! She tells me about her books all the time. I'll have to check this one out. I'll put it on our list as well. If you're ever in the mood for another really sad book "The Clown of God" had me and Bohdin not just crying but sobbing. Cynthia Rylant is another good author. Bohdin also likes Eric Kimmel and Bill Peet. Some of their books are good and some not as good. They are his two favorite authors. Beth, I am so jealous! Polacco has an interesting story, part of which she tells in this book.Helen, thanks for the author recommendations. We're Bill Peet fans, but I haven't seen Rylant or Kimmel. Will definitely check them out.And thanks for the warning on The Clown of God. That's one of the Five in a Row books. I gotta say, I love the FIAR curriculum, but man, a lot of those books are really heavy. I'm looking over the list and I estimate that we've only read about a third of them. There is a tremendous variety. Some were boring and some excellent. Many were above Bohdin's head at the time. I've thought about making a list of some of Bohdin's favorite books for you guys. I don't know if you would be interested. Bohdin tends to go for historical stuff and folk tales. He really liked the Arabian Nights Tales for instance. I would be very interested in a list of your favorite book!